Elly the Reindeer is a cute cartoon-style reindeer. She has adventures with her animal friends in a sweet rural setting where all the child-like characters live in their own homes and look to each other for help, fun and solving the occasional dilemma. 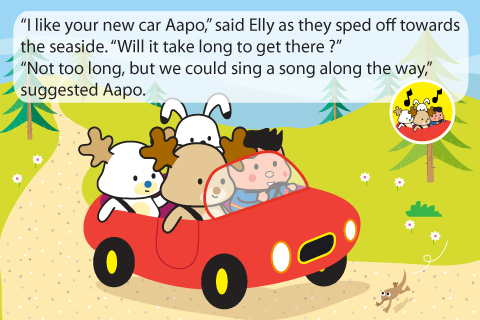 In this story Elly goes to the seaside with her friends. She rides with her friends to the beach, singing all the way. They play in the ocean, build sandcastles and explore the tide pools. Elly even finds a large shell as a souvenir. When it's time to go, the group heads home having had a fun, full day. At bedtime, Elly thinks of all the wonderful adventures she's had that day, putting the sea shell against her ear to hear the sound of the waves. This cute series of books has become a fast favorite of my preschooler at bedtime. There is no narration, but it is planned for a future update. They are short & sweet, perfect for bedtime. With features like simple swipe-style page turning and an easy to read font, they are also a good choice for children learning to read. All of the Elly books are enhanced with just a tiny bit of interactivity, featuring a single sound on about half the pages. This sound effect is tied to the text on the page, like wind blowing or a bicycle bell. It is triggered by tapping in a small circled image that corresponds with the sound. It is a nice little extra, but nothing to distract too much from the story or overstimulate a child at bedtime. Like the other Elly books, this title features the same child-like animal friends that demonstrate positive pro-social behavior toward each other. It is perfect for reading to young children at any time of day. It would nice to see narration added to these titles, but even without, they are delightful and engaging for young readers and listeners. All reviews are of the app, not the platform/device. Based originally on iPad versions. Minor technical details may vary. Our editorial rating – an impression of the whole book overall. We also consider how the app compares to other apps currently available. Note: It is not a sum of the other ratings. The average rating from users signed into the Digital-Storytime.com site (who checked the 'own it' box). We consider both technical & visual appeal of the animated elements. We focus on quality rather than quantity, although very little animation will rate slightly lower on this scale (to allow proper sorting). Overall quality of audio elements. We consider whether the music & sound effects are easy to listen to and well-matched to the story. Narration, when present, should be clear & well-articulated. We consider all the interactive elements of a book app. We look for interactivity that is well-matched to the story & engaging but mark down for interactivity that interfere with reading comprehension. Overall value the app can offer, either as a book app that can occupy the reader for hours or a story that will be returned to for many re-reads. We do not take price into consideration, since it often changes. We consider length (under 10 minutes is ideal), enhancements & extras (ideally not too overstimulating), as well as story content that is appropriate for children at night-time. Overall educational value. We consider enhancements, added content (like reading comprehension questions or other suggested activities) and any unique educational value that makes the app stand out. We consider the story, art, concept, design & execution of the app. Apps based on folktales & previously published titles will score lower unless they have a unique presentation. We consider anything in the app that goes beyond the story, like games, puzzles, coloring pages, etc. High ratings in this category mean the extras are well made, engaging and have high replay value. In this ebook, the fifth of the Elly the Reindeer books, Elly goes to the seaside. She packs her things for the beach and rides along with her friends in Aapo's new convertible. They decide to sing on the drive. When they get to beach they change into swimsuits and head into the chilly ocean. They enjoy the waves and play with a beach ball. But then Harry's paw is pinched by a crab. So they decide to build a sandcastle instead. Elly finds a big sea shell and puts it to her ear to hear the sea. Then the group explores the rock pools, finding a starfish. When it's time to go home they pack up. They see Owl on the drive back, hooting "Good night!" Elly had such a wonderful day that when she crawls into bed that night she feels nostalgic, listening to her sea shell for the sound of the ocean. Other Apps with similar ratings.